DonQui has guests coming over. Immediately his thoughts turn to supper. So while Duchess goes to Southwold to select a bird from his friends at Mills and Sons Butchers, DonQui goes up to the allotment to pick some curly kale, pull up some carrots and go to the farm shop for some potatoes (as he did not grow any this year). Now DonQui believes that the trick to a good roast dinner is getting everything ready well in advance. 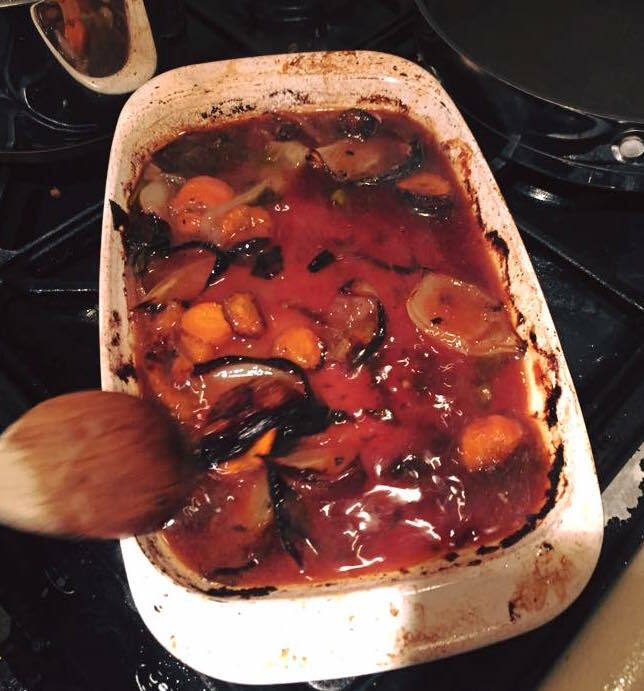 Potatoes and vegetables parboiled, gravy base prepared and then everything can be finished off at the end with no stress. When it comes to gravy he is a bit of a stickler. He likes to make it all from scratch without any packaged stuff — most of which tends to be salt and various additives. So with the guests arriving in a couple of hours, DonQui gets to work. 1. 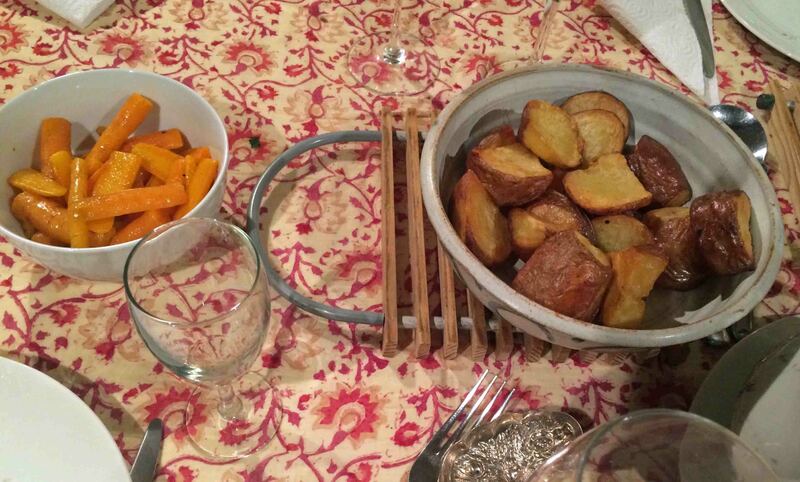 Parboil the potatoes and set aside. 2. Prepare the gravy base. a mix of fresh herbs such as thyme, rosemary, oregano, sage. Take the chicken out of the fridge at least 30 minutes before cooking so it comes up to room temperature. Roughly chop carrots and celery, quarter the onion, then place vegetables onto a roasting tray and drizzle with olive oil. Place chicken in the middle of the roasting tray on top of the vegetables. Drizzle with olive oil and rub salt and pepper all over it. Cut the lemon in half and put in the cavity along with the herbs. Put the chicken into the preheated oven and turn down to 180°C. Baste the chicken halfway through cooking and if the veg look dry, add a splash of water to stop them burning. 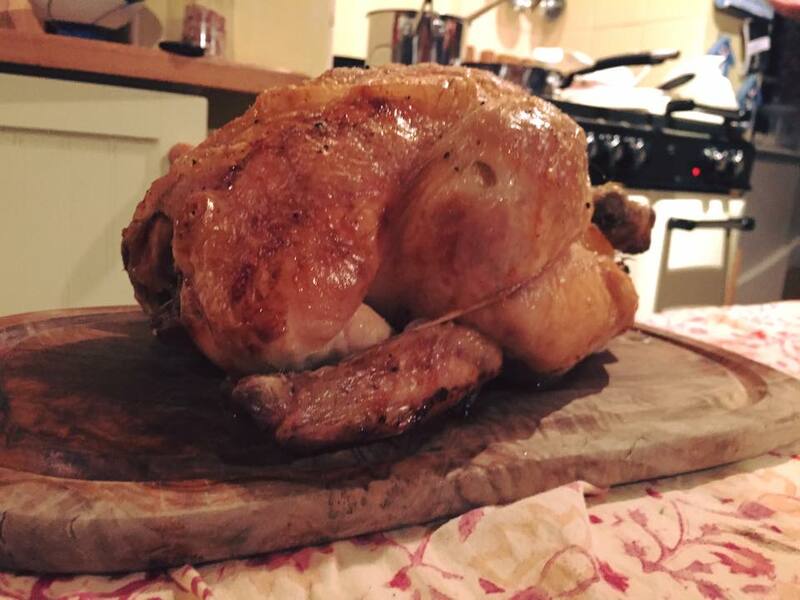 Take the chicken out of the oven and put it on a carving board to rest for 15-20 minutes. Some people like to cover it with tin foil while resting but DonQui does not like doing that as it makes the nice crispy skin go soft. While the chicken is resting finish off the gravy and vegetables. a bunch of frush herbs (such as thyme, rosemary oregano, sage). 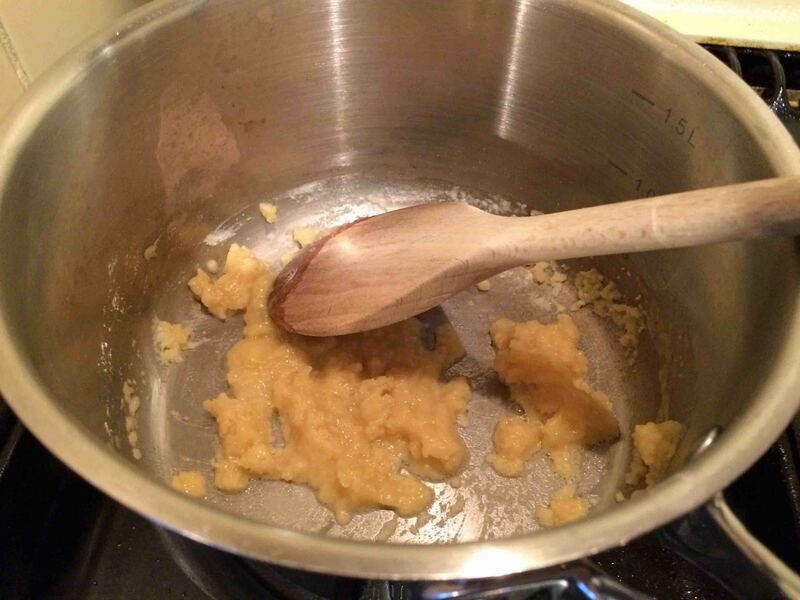 Make a roux by combining the flour and butter in a heavy bottomed saucepan. 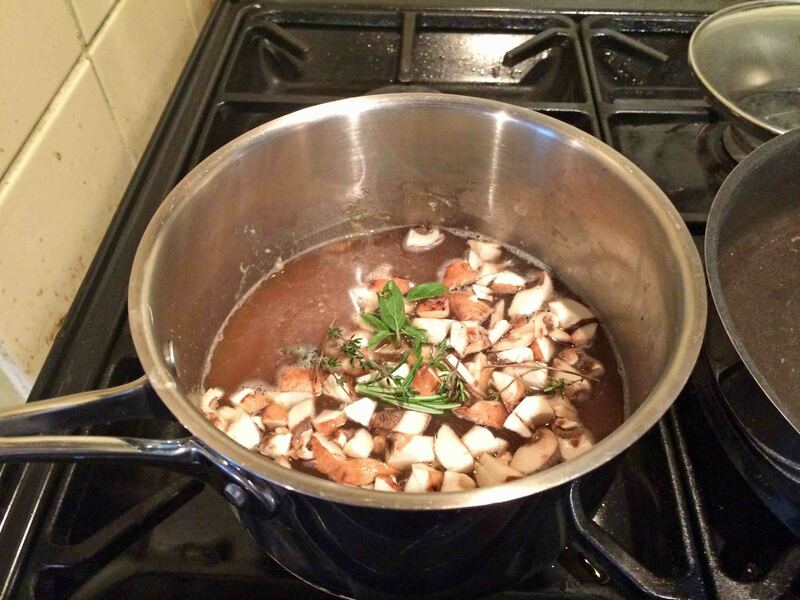 Cook over a low heat, stirring frequently with a wooden spoon until the roux begins to darken slightly. Remove from the heat and let cool for about a minute then whisk in the stock. Add vegetables, herbs, salt and pepper. Be careful with the salt. 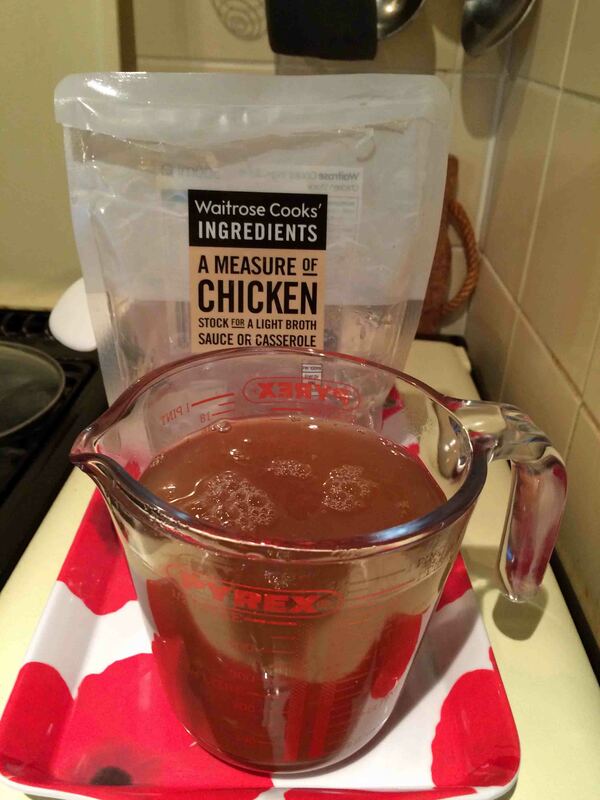 Some chicken stock is often already heavily salted so it is better to taste it and gradually add the salt. It is easy to add more, impossible to take any out. Cook on a very low heat for 20-30 minutes then strain. Put the strained gravy base back into the pot and wait until the chicken is cooked. Once the chicken is resting, place the roasting pan with the vegetables on the stove top on low-medium heat. Deglaze the pan with the white wine making sure to scrape up and disolve all the brown bits. Strain into the pot, pressing any residual juices from vegetables through the sieve. Whisk together with the rest of the gravy base and then simmer very gently until everything else is ready. Wash and quarter a couple of medium potatoes per person. You can peel them if you like but DonQui often likes to leave the skins on as he does on this occasion. 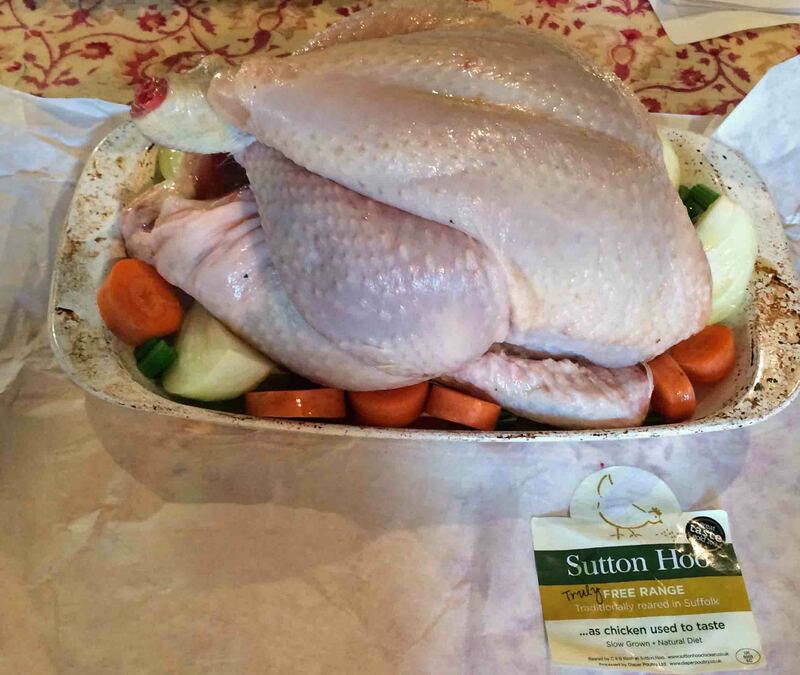 Parboil in salted water for 10 minutes, drain and set aside until you are ready to begin roasting. All of this can be done well in advance. Place the potatoes on a roasting pan, drizzle with a goodly amount of oil — DonQui likes using a mix of oils, and goose or duck fat if he has some. Put them in the oven with the chicken when there is about 45 minutes of cooking time left for the chicken. The potatoes should take about an hour to get nice and crispy brown. Turn every 15-20 minutes and sprinkle with salt in the just before serving. 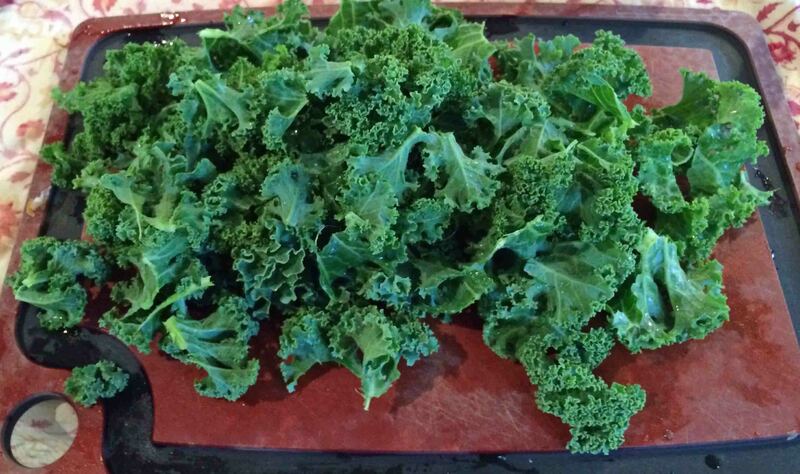 Wash the kale, strip the leaves from the stalks and roughly break apart into small pieces. 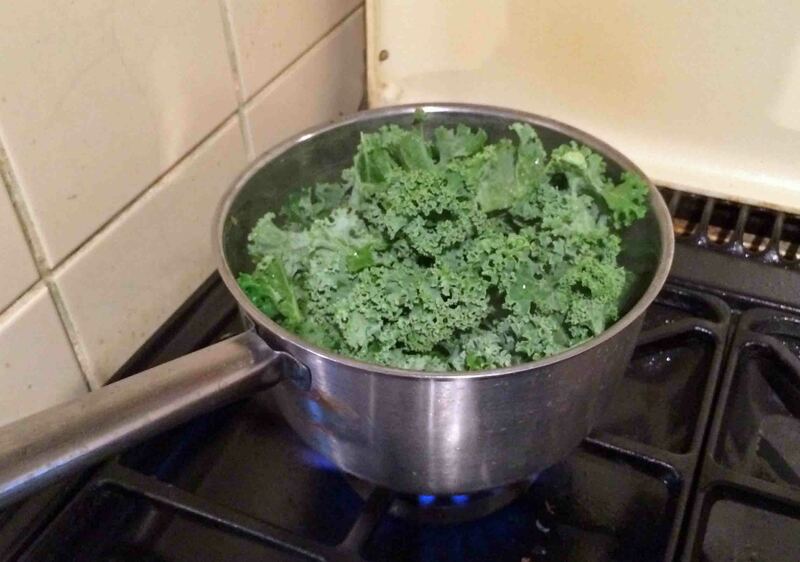 Bring a small amount of water to the boil in a pot, add the kale, put on a lid and simmer for 5 minutes. Don’t worry if it seems like a lot of kale at first. It will reduce down. Wash and scrape the carrots. Cut into relatively even pieces. DonQui prefers carrots cut lenghwise rather than across but it is a matter of personal taste. Boil the carrots in salted water for 7 minutes. DonQui also likes to add a bit of sugar to the carrot water. Drain and set aside until the chicken is out of the oven and resting. 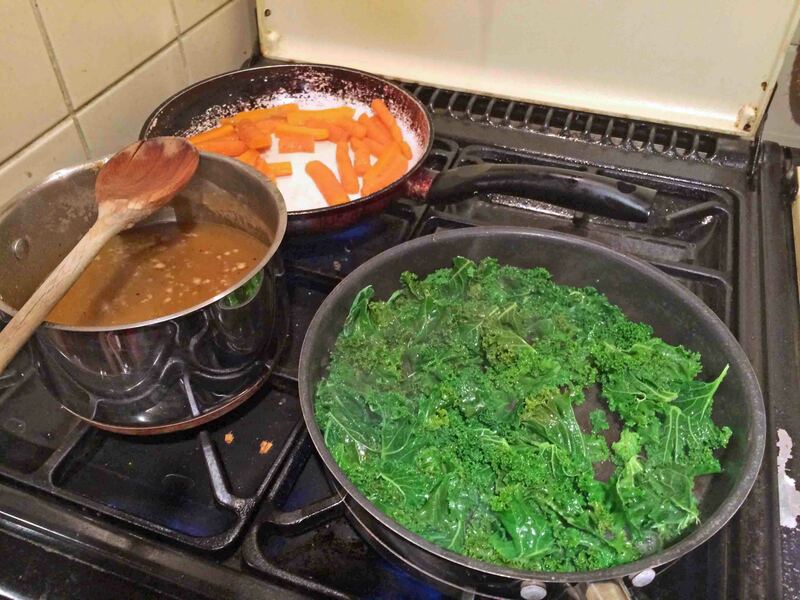 With the chicken resting, the potatoes done and the gravy simmering it is time to finish off the kale and carrots. In both cases the method is the same. Simply melt a bit of butter in a pan, add the partially cooked vegetables and stir around in the butter until heated through. This will take around 3-5 minutes. 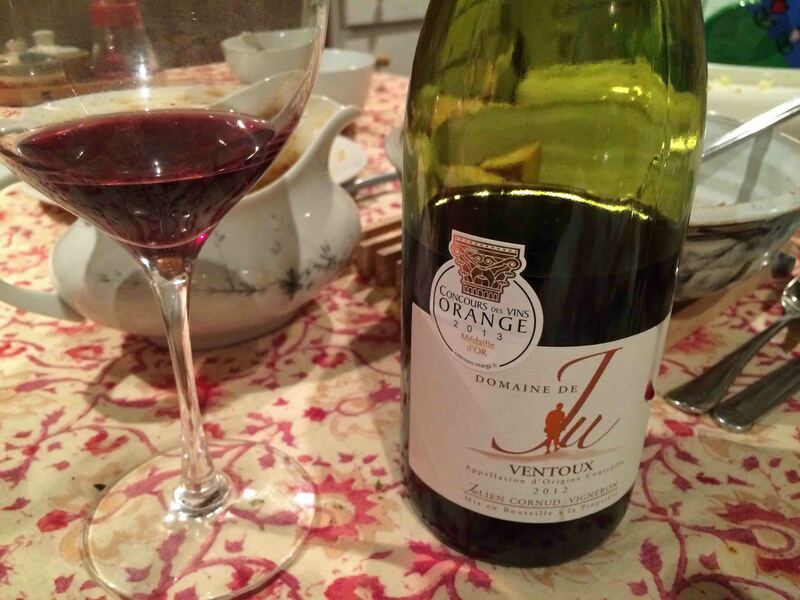 …which was rather nicely washed down with a fine bottle of Côtes du Ventoux which DonQui had picked up in the South of France a few months ago. 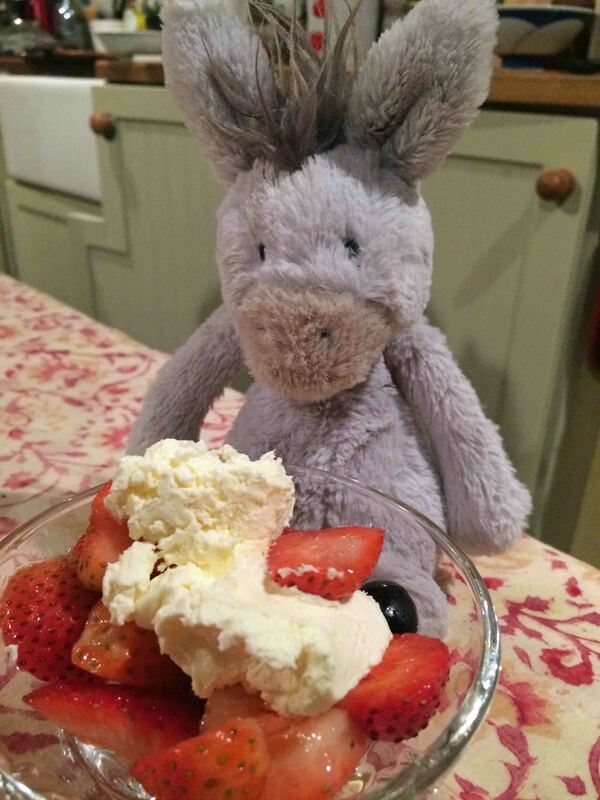 …strawberries from DonQui’s autumn crop along with a few grapes from the garden and clotted cream.